To take on Xiaomi and Micromax in budget phone market, Asus has launched it’s best budget smartphone, Asus ZeFone C ZC451CG with Intel Atom Z2520 processor with Intel Hyper Threading Technology and 5-MP PixelMaster’ camera in Indian market. Asus ZeFone C ZC451CG will be available online through Flipkart from 11th Feb, Wednesday and in stores from 18th Feb. in Black, White and Red Colour option. The all new Asus ZenFone C supports Dual-SIM(GSM+WCDMA) with Dual SIM offers connectivity through Wi-Fi, Wi-Fi direct, GPRS/ EDGE, GPS/ A-GPS, Bluetooth 4.0 with A2DP, and Micro-USB comes with a 4.5-inch TFT LED Backlight FWVGA display with resolution(480×854) with Corning Gorilla Glass 3 perfect for watching movies, playing games and reading e-books. Asus ZenFone C runs on Android v4.4 KitKat OS with ZenUI on top(upgradable to Android 5.0 Lollipop) and powered by a 1.2GHz dual-core Intel Atom Z2520 processor with Intel Hyper Threading Technology with 1GB RAM makes multitasking a fun, gives immersive game environments and reducing power usage and heat while 8GB internal Memory and 64GB expandable memory offers enough space for your favurite games, apps, songs and Music. For shooting, Asus ZenFone C offers you a 5-MP ‘PixelMaster’ rear camera with autofocus, f/2.0 lens, LED flash and 0.3-MP VGA front camera with f/2.8 aperture for clicking selfies and making video call. It also includes a 2100mAh battery promising talk time up to 18 hours(3G) and standby time up to 353 hours measures 136.5 x 67.0 x 10.9 mm and weight 149gm. 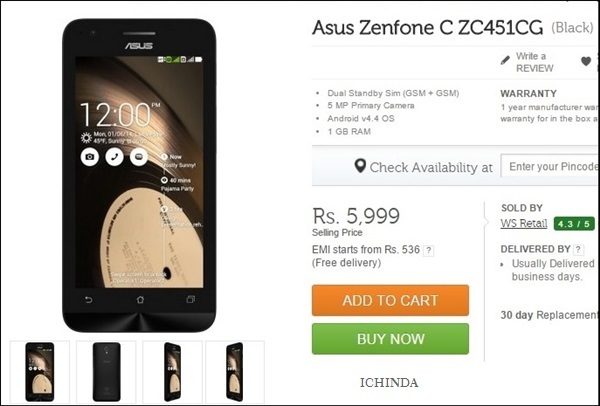 Asus has recently launched ZenFone 2 (ZE551ML) has recently launched at CES 2015 along with Asus ZenFone Zoom. Asus ZenFone 2 will be available in by March in Q1 2015 price starts at $199 (Approx. Rs. 12,600) in Ceramic White, Glacier Gray, Glamour Red, Osmium Black, and Sheer Gold colour option while Asus ZenFone Zoom wil be available in Q2 priced at $399 (Approx. Rs. 25,300) in Glacier White and Meteorite Black colour option. At last I would like to say that Asus ZenFone C is specially designed to counter Xiaomi and Micromax in budget phone market. What you think? Please be first to write a review.